Shake Shack reported top and bottom line results that topped Wall Street expectations. Shares dropped about 3% following the results. 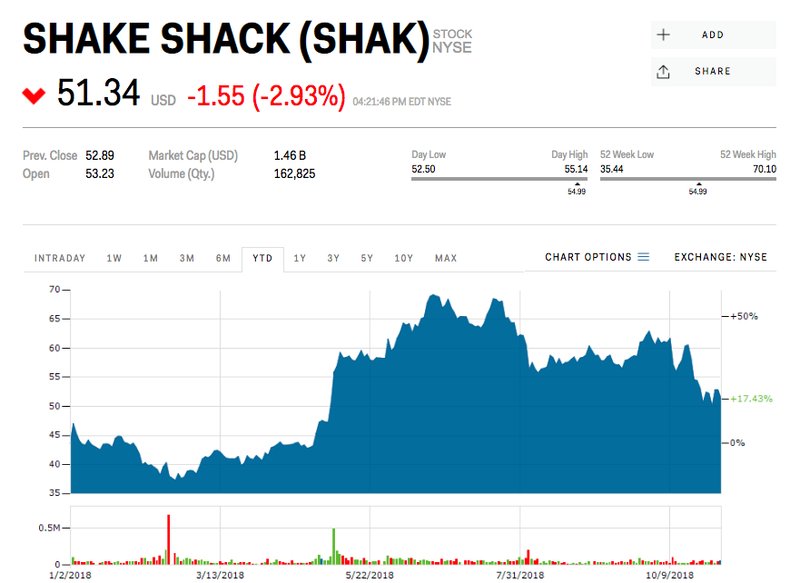 Shake Shack on Thursday reported top and bottom line results that beat Wall Street estimates, but same-store sales fell short. Shares were down about 3% following the results. The burger chain said it earned an adjusted $0.21 a share on revenue of $119.6 million, beating the $0.13 and $116.8 million that analysts surveyed by Bloomberg were expecting. However, its so called Same-Shack-Sales fell 0.7%, missing the 0.9% gain that was expected. „We’re pleased to report that Shake Shack’s overall growth remains strong as we head into the end of 2018,“ CEO Randy Garutti said in the earnings release. Shake Shack raised its full-year revenue guidance to between $450 million and $452 million, up from $446 million to $450 million, and said it plans to open 33 or 34 new stores this year.